Here is a quick example of how a little vertical garage storage can go a long way! 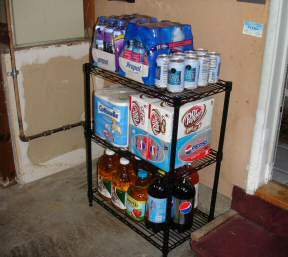 We keep our excess supply of sodas and other beverages out in the garage until we need them. (Yeah, it would be nice to have a small refrigerator out there so they would be cold as well.) 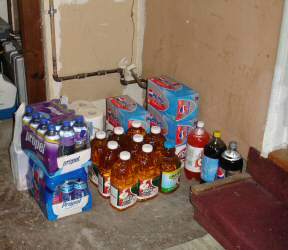 Anyway, after making a soda run to the store, the area would look much like this, or even worse. This setup would take up space and make it difficult to squeeze on over to the laundry area or over to the other side of the garage. Once I bought the shelf, this entire project took me less than one hour. And look at the difference it made! First of all, it just looks and feels better! There is truly something soothing to the sole when things are neat and orderly. It also left a lot more floor space clear for getting around in the garage. This is a perfect example of how to use vertical space. And now, off to the rest of the garage!